Smithsonian Art Inventory Control Number: UT000176. 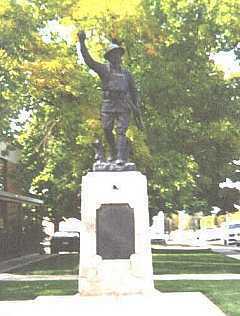 Formerly on the U. S. Post Office lawn at the Southwest corner of Main and Center Streets, now a block south, near the Utah National Guard Armory at 120 South Main Street. Tablets on the sides and back of the base have honor roll lists of names. A nearby memorial on the other side of the Post Office lawn honors, by name, all those from Beaver who died in World War I and World War II. Although the bayonet is missing, the sculpture is coated in a protective layer of gray paint and appeared to be in excellent condition when Les Kopel visited in 2004 when the above photos were taken. However, a second visit in July, 2010 revealed paint erosion along the seams in the legs and tree stumps. The photo at left, provided by Joan Beal, Beaver Public Library, shows the monument before both the badly cracked base and the sculpture were restored. 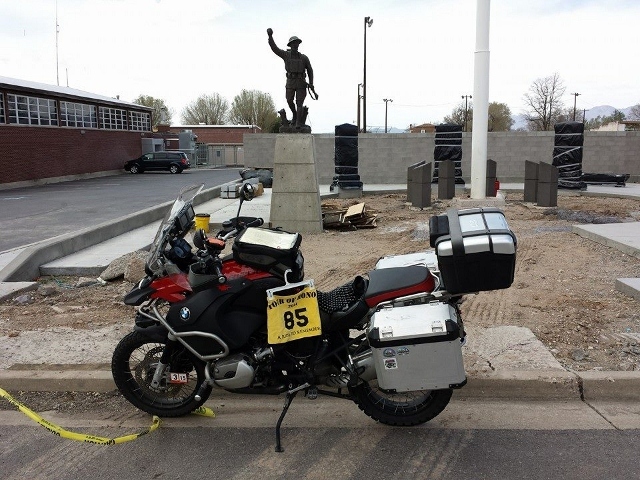 Below: The Doughboy was moved a block south of its former location to the new Veterans Memorial Park next to the Utah National Guard Armory at 120 South Main Street. The new park and the statue were dedicated on May 26, 2014. The Doughboy stands at its new location in Memorial Park. Photo: Kit Chuhhawong, Rider 85, 2014 Tour of Honor.